Review by AllTheBestFights.com: 2018-01-20, good fight between Errol Spence Jr and Lamont Peterson: it gets three stars. The undefeated Ibf Ww champion Errol Spence Jr entered this fight with a perfect record of 22-0-0 (19 KOs=86%) and he is ranked as the No.5 welterweight in the world (currently the #1 in this division is Keith Thurman). In his last three bouts he has won over Chris Algieri (=Spence vs Algieri), Leonard Bundu (=Spence Jr vs Bundu) and Kell Brook (=Brook vs Spence Jr). His opponent, the world champion in two different weight classes Lamont Peterson, has an official boxing record of 35-3-1 (17 knockouts) and he entered as the No.7 in the same weight class. He lost to Danny Garcia in 2015 (=Garcia vs Peterson) but then he has beat Felix Diaz (=Peterson vs Diaz) and David Avanesyan (=Avanesyan vs Peterson). 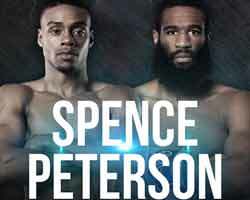 Spence vs Peterson is valid for the IBF World welterweight title (Spence’s first defense). Watch the video and rate this fight!